Programs - Most Include Backing! > Bag Ladies BOM! These Bag Ladies are a HOOT to make! The Bag Ladies are a group of 12 lovely ladies who portray themselves as Bag Ladies. They are all unique as most Bag Ladies are. They all dress a little differently, certainly some eccentricity apparent and there accessories are eclectic at best. They come from all walks of life and their ties to family or old friends may have been lost. But, they found a place, where they were accepted for who they are and what they bring to the group. They all have one common interest in quilting. They all show up every Friday night at the local quilt shop to sit and enjoy their stitching with each other! In this 12-Month BOM Program you will make 12 bag ladies! 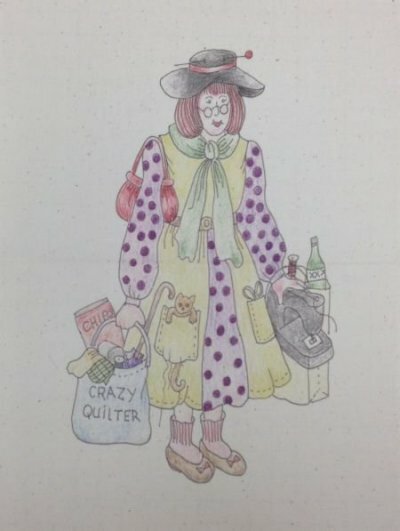 Each bag lady pre-printed and pre-colored on an 8 1/2" x 11" fabric and are ready to start stitching! Thse are printed on a light tea-dyed fabric with a paper backing. 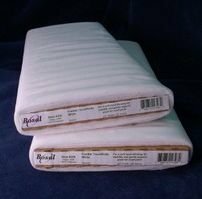 When you get your kit, you will remove the paper back and then apply the Bosal Tricot fusible (included in your first month's kit) to the back of your lady. This will help stabilize your project as you stitch. 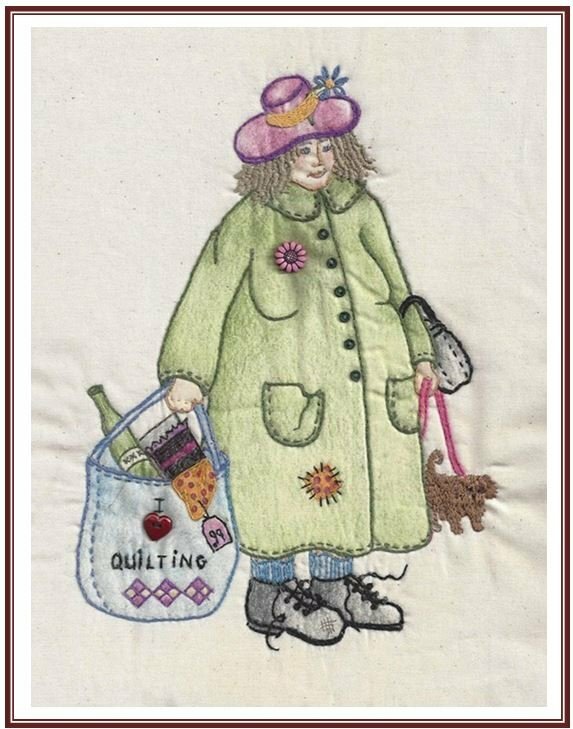 Bag Ladies are easily completed with basic embroidery stitches. Embellish them with buttons, beads, and charms to personalize them and use them as gifts for your friends and family. 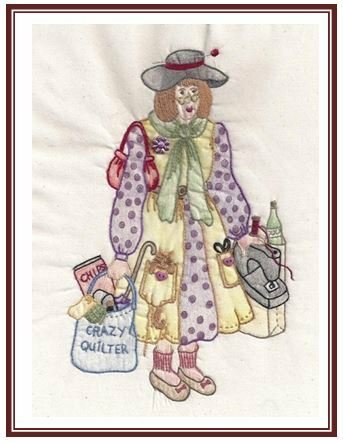 Bag Ladies can be made into small individual wall-hangings, pillows, a larger wall hanging, or even a quilt. We'll provide various setting options through the year! Choose the BOM Program option or the Complete kit from the dropdown box at the top. If you choose the BOM program option, your $ 19.99 reservation fee will apply towards your final kit. This means that in month 11, you will be billed for month 11, but we will ship months 11 and 12! * 12 Bag Ladies - pre-printed and pre-colored! * DMC Floss Kit - Over 42 Skeins! Each month you will receive 1 Bag Lady. In the first month, you will also receive your Hand Emboidery Guide, DMC Floss Kit and Bosal Tricot fusible. 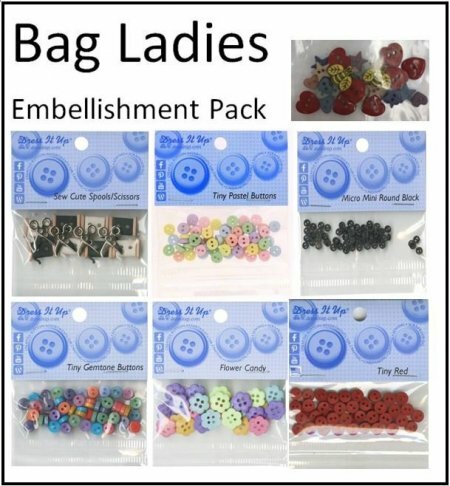 CLICK HERE TO ORDER THE EMBELLISHMENT PACK. Here is one possible Bag Ladies setting for a quilt. This one uses 1930s and reproduction scraps with 1 1/2" sashing strips. NOTE: The quilt setting is not included in this program. 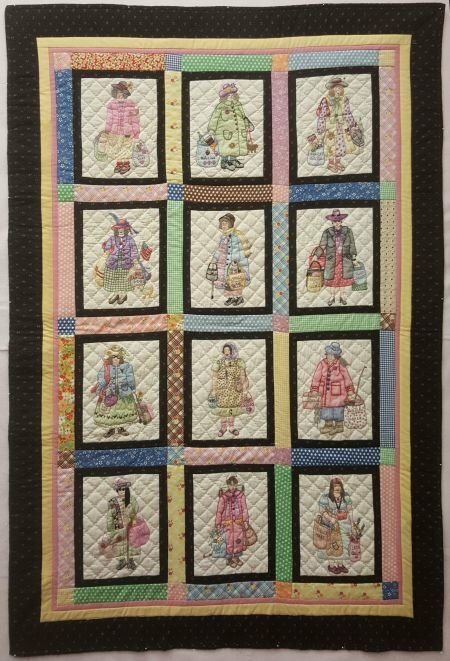 You can frame the ladies or set them in a quilt, use on pillows, bags, or add fabrics for a monthly mini-quilt. We prepare all kits in advance, so when you sign up we put your name on the bag. You can have confidence that EVERYTHING is in the bag to complete your project! Because everything is done in advance, we can be very flexible as to how many kits to send you each month. Many people choose a traditional Block-per-Month format. Others have us send 2 or 3...or the whole kit! It's really up to you and how fast you sew! SHIPPING NOTE: If you choose the complete kit option, you should save about half of the shipping costs, depending on distance from our shop in Concordia, KS.